A lender of last resort is a lender that provides loans to governments, businesses and private individuals who cannot get a loan any other way. These lenders are either government entities such as the U.S. Federal Reserve, intergovernmental organizations, such as the International Monetary Fund and private banks. The government entities act as lenders of last resort for economic and political reasons, while private lenders are primarily motivated by profit. While loans of last resort can be a boom to desperate borrowers, they also carry a number of problems that can make the situation even worse. Most countries have government-run financial institutions that, among other things, provide funds to financially troubled companies and non-profit organizations. In the United States, this role is played by the Federal Reserve. Entities like the Federal Reserve act as lenders of last resort for companies that are so large, and well-established, that their collapse would affect millions of people. The reserves hopes that the funds will be enough to get large companies back on their feet and become profitable again. Most recently, government financial institutions acted as lenders of last resort in an effort to contain the fallout from the 2007 economic crisis. Critics of government-based lending of last resort argued that it gives companies an incentive to engage in risky financial practices. The argument is that since they know that no matter how many losses they suffer, the federal government will always provide loans, large financial institutions will continue to engage in risky behavior. Some critics went as far as to suggest that the companies' financial collapse is ultimately good for the economy, arguing that their demise would eventually pave the way for companies that would be more prudent with their finances. Intergovernmental organizations act as lenders of last resort for developing countries that find themselves on the verge of economic collapse. These collapses usually carry devastating consequences, depriving millions of people of government services, taking away security and rendering their savings worthless. These types of collapses trigger a massive influx of refugees, taxing other countries' resources and social support systems. The problem with this sort of lending of last resort is that the loans will eventually have to be repaid. This is an issue because it puts the strain on the country's budget It takes away the resources it could use to rebuild its economy. This can lead to a vicious cycle. In effort to repay the loans, the country takes out more loans, which increase its payment obligations and force it to pay more loans. The only way to break the cycle is to forgive some, if not all, of the country's loan obligations. However, intergovernmental organizations have obligations towards governments that finance them. It can't forgive the loans unless all the countries that support it agree to forgive them. Private lenders of last resort provide loans to individuals and small businesses that are deeply in debt and can't get loans anywhere else. Their primary motivation is profit. 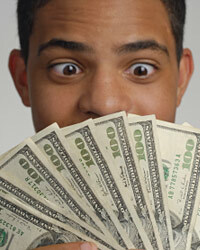 Lenders earn their money from interest payments. Since the distressed borrowers have bad credit history, they can charge higher interest rates than they do with more financially sound borrowers.